Decoherence is one of the most important obstacles that must be overcome in quantum information processing. It depends on the qubit-environment coupling strength, but also on the spectral composition of the noise generated by the environment. If the spectral density is known, fighting the effect of decoherence can be made more effective. Applying sequences of inversion pulses to the qubit system, we generate effective filter functions that probe the environmental spectral density. Comparing different pulse sequences, we recover the complete spectral density function and distinguish different contributions to the overall decoherence. via [1106.3463] Dynamical decoupling noise spectroscopy. via Phys. Rev. Lett. 106, 240501 (2011): Robust Dynamical Decoupling for Quantum Computing and Quantum Memory. Error tolerance of different DD sequences. 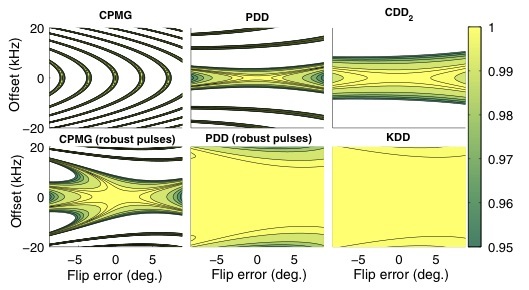 The upper row shows the calculated fidelity F for standard DD sequences, while the lower row shows the results for the CPMG and PDD_1=XY-4 sequences when the pi pulses are replaced by Knill pulses. The last panel corresponds to the KDD sequence, also based on the Knill pulse. Each panel shows the fidelity after 100 pulses as a function of flip-angle error and offset errors. The regions where the fidelity is lower than 0.95 are shown in white. The highest contour level is F=0.999.